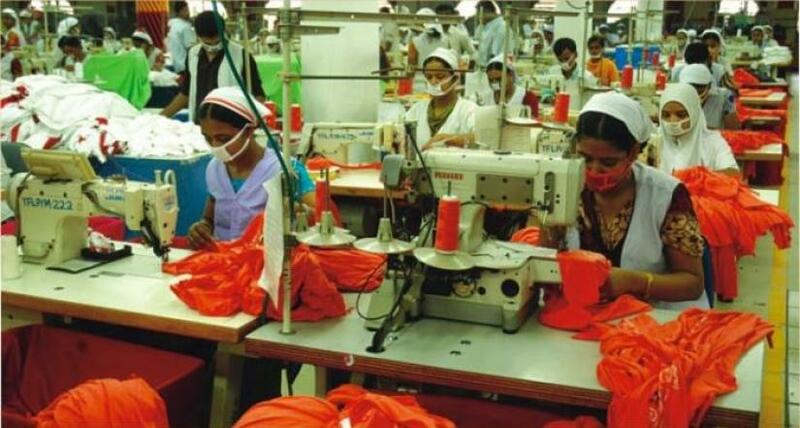 Labour unions have rejected the revised minimum wage of Tk 8,000 (apprx $100) for ready-made garment (RMG) sector workers and demanded it to be doubled up at the least. Leaders of the unions on Friday demanded Tk 16,000-18,000 (apprx $200-$225) as minimum wage at a human chain and protest rally demonstration organised in front of the National Press Club. Describing the minimum wage Tk 8,000 as unfair, leaders of Garment Workers’ Trade Union Centre, Garment Workers’ Front and Garment Worker Rights Movement have demanded it to be revised in line with the wage of state industry workers. They alleged that the government is favouring the garment owners leaving the workers deprived when it comes to readjusting wage. Garment Workers’ Trade Union Centre demanded immediate fixing of minimum wage at Tk 16,000. Labour leaders said that it’s impossible to survive with Tk 8000 income and keep working at the same time. “Minimum Wage for workers in the state-owned sectors has been announced to be almost Tk 18,000, whereas, garment workers’ wage is less than half that amount. Workers of the highest exporting sector in the country will never accept this discrimination,” they added. Socialist Workers Front acting President Abdur Razzak and Garments Worker Front General Secretary Selim Mahmud were present among others in the protest rally, presided over by Garments Workers’ Front President Ahsan Habib Bulbul. On Thursday, State Minister for Labour and Employment Mujibul Haque announced that the revised minimum wage for RMG secor workers will be set at Tk 8,000. The existing minimum monthly wage of Tk 5,300 ( apprx $65) has been in effect from Jan 1, 2014. Workers unions had been campaigning for a minimum wage of Tk 16,000, while garment owners had proposed an increase to Tk 6,360.